The SSN European Paintings pre-1900 will be holding its next Study Day, kindly supported by The Pilgrim Trust, on 30 November 2017. The Study Day coincides with the current exhibition ‘Reflections: Van Eyck and the Pre-Raphaelites’, presented by the National Gallery in collaboration with Tate. Featuring key loans from Tate’s Pre-Raphaelite collection, the National Gallery’s ‘Arnolfini Portrait’ by Jan Van Eyck will for the first time be shown alongside paintings such as Dante Gabriel Rossetti’s ‘The Girlhood of Mary Virgin’ (1848-9), William Holman Hunt’s ‘The Awakening Conscience’ (1853) and William Morris’ ‘La Belle Iseult’ (1858). The exhibition explores the profound influence that Van Eyck’s celebrated ‘Arnolfini Portrait’ had on the Pre-Raphaelite painters and their thoughts on empirical observation, draughtsmanship, colour, technique and the symbolic meaning of objects. 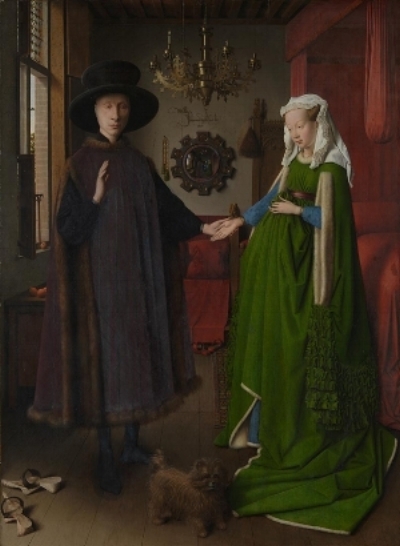 The show also illustrates the way in which artistic motifs used by Van Eyck, such as the convex mirror, were adapted by the Pre-Raphaelites. The exhibition is jointly curated by Susan Foister, Deputy Director and Curator of Early Netherlandish, German, and British Paintings at the National Gallery, and Alison Smith, Lead Curator of British Art to 1900 at Tate. The Study Day will include admission to the exhibition and provide an exciting opportunity to meet the curators and explore the aims and main themes of the exhibition in a joint discussion. For more details and timings please click here. To book a place, and to request a travel bursary, please email ssn@ng-london.org.uk by Thursday 23rd November 2017.